Welcome to Seacoast Safaris... whether your focus is adrenaline fuelled RIB rides, nature cruises or a relaxing family day out we have it covered! From our leisurely Puffin Island Cruises to our high-speed adrenaline fuelled RIB Rides and everything in-between, we cater for the whole family, so why not join us in ‘Exploring Wild Wales’. 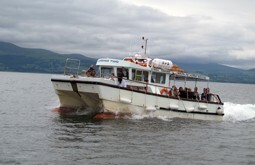 As Beaumaris’ number one attraction, situated on the banks of the Menai Straits in the eastern most corner of Anglesey, we are perfectly positioned to offer the most stunning, beautiful, scenic and wildlife packed boat trips. Our company ethos is all about experiencing nature and wildlife in its natural habitat and ensuring the best wildlife encounters with minimal disturbance. We believe in bringing people closer to the very best of Anglesey’s wildlife. We are the only operator in the area to have a range of vessels to offer different boating experiences. Seacoast Cruises suitable for the whole family (including the dog) lasting approximately 90-minutes aboard one of our 54 seater passenger vessels, or an action packed adventure RIB Safari to blow the cobwebs off. If you fancy something different or bespoke we do run special tours and you can also charter any of our vessels privately. All our fully qualified skippers have fantastic local knowledge, a keen eye and a genuine interest in the wildlife. Amongst the crew, we can boast a marine biology graduate, a published author, and lifeboat crew. Some of the crew are also keen SCUBA divers and historians and throughout the year we have volunteers on-board to help point out and give detailed explanations of the wildlife. Please enjoy our website, check out the different boats and tours we have available, most are available to book online, but if you can’t find what you’re looking for, or if it’s outside of the main season then please contact us. Please make sure you reserve your seats for all the trips, we can fill up quickly so please book to avoid disappointment. We can also cater for private parties, school groups, corporate events or stag & hen parties, please contact us to arrange your bespoke tour. Don’t forget we also have gift vouchers available too, the perfect choice for someone special who already has everything. 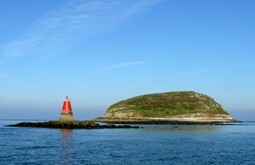 Certainly our most popular cruise and it’s easy to understand why, during your leisurely 90 minutes you’ll take in some wonderful scenery and landmarks including Penmon Lighthouse and you’ll also spot plenty of wildlife. Puffin Island is a bird sanctuary and a nesting site for many species of breeding seabirds, there’s also a resident colony of Atlantic Grey Seals. You may even be lucky enough to encounter porpoise, sometimes even dolphin. A popular choice for tourists and locals alike, many people travel over the bridges onto the island, but few can say they’ve travelled under them. This 90-minute cruise will head in a South Westerly direction down towards Menai Bridge with breath-taking scenery and awesome architecture. Look out for grey heron standing like statues along the banks while other wading birds such as oystercatchers and curlew explore the lower shores. 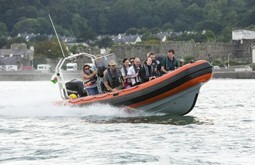 This, the choice for the more adventurous who want a faster pace, each RIB is licensed to carry 12 passengers. You’ll get out to the same places as the cruise boats, Puffin Island or the Menai Straits and ‘Swillies’, just a lot quicker, and with some high speeds turns and tricks along the way. Perfect for the young and young at heart. Planning a special event? Birthday, Wedding, Corporate entertaining, Team building, Party? Why not book an entire boat to yourself? Any of our vessels can be privately chartered, from a 30 minute speed boat trip to a full day’s cruising, price includes skipper and crew. Our RIBs can each carry 12 passengers and our cruise boats can each carry up to 54 passengers. We have a capacity to carry 142 at any one time. While it is all about fun and fantastic wildlife encounters you just need to know that at Seacoast Safaris we are all maritime professionals with many years’ experience between us. We’ve always been ahead of the game with our safety policies and all our vessels are always up to spec with the maritime safety legislation requirements. A regular maintenance schedule, improvements and recent refurbishments keep our vessels not only safe and reliable but also helps to improve our ‘green’ credentials too (our diesel emissions have reduced by 25% since 2014 following engine replacements). Our licensing and safety documentation is available for you to view or download, please click below for further information.